Another year comes to a close, and as is traditional, this December 2000 AD will be publishing two thrill-packed bumper issues. These will contain a range of stunning one-off stories and the first episodes of many series that will be keeping 2000 AD fans' thrill receptors warm over the chilly early months of 2004. First up, 2000 AD Prog 2004 contains 100 pages of Class-A thrills, for only £3.95, barely held in place by a stunning new Duncan Fegredo cover. Highlights include a 12-page one-off Judge Dredd story, 'The Good Man', by John Wagner and Jim Murray (Murray's first strip work for 2000 AD in five years! ), the long awaited return of Nikolai Dante by Robbie Morrison and John Burns, and the even-longer-awaited comeback of Robo-Hunter by the classic team of Alan Grant and Ian Gibson! Other returning heroes include Slaine (Pat Mills/Clint Langley), Caballistics Inc. (Gordon Rennie/Dom Reardon), The Red Seas (Ian Edginton/Steve Yeowell) and The V.C.s (Dan Abnett/Anthony Williams), plus a terrifying one-off tale, 'Monsters of Rock', by the Necronauts team of Gordon Rennie and Frazer Irving. All this will be topped off by a Sinister Dexter text story, pin-ups and much much more. Not to be outdone, 2000 AD's sister publication presents an equally sizzling line-up in Megazine 214, behind a jaw-dropping Greg Staples cover. Kicking off the issue will be three new Dredd thrillers - 'Turkey Shoot' by John Wagner and the art dream-team of Cam Kennedy and Henry Flint, closely followed by the return of the savage reptilian legend in 'Blood of Satanus II: Dark Matters' by Pat Mills and Duke Mighten, and 'Bernard' by Jonathan Morris and Adrian Salmon. 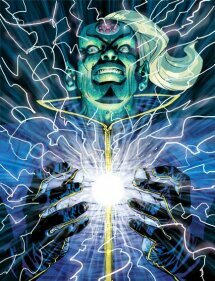 Judge Anderson also makes a welcome return, in 'Half-Life' by Alan Grant and Arthur Ranson, and a certain other much-loved character shows up in 'Whatever Happened To... Tweak? ', by Pat Mills, Chris Weston and Garry Leach. That is merely the tip of the iceberg, however. Megazine 214 also contains 'The Dredd Files', a complete rundown of every creep and every crime Dredd has faced in his many years on the streets, plus the continuing 'Judge Death: The Wilderness Days' and 'Xtnct - Th Fnl Shwdwn!'. 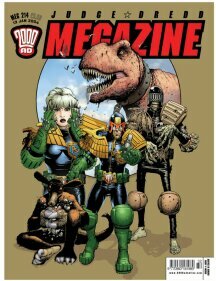 And there's more - bagged up with the Megazine will be a classic thrill supplement featuring the entirety of celebrated Strontium Dog story 'The Galaxy Killers', by John Wagner and Carlos Ezquerra, plus a massive double-sided poster, all for only £5.99. 2000 AD Prog 2004 and Judge Dredd Megazine 214 will be on sale from 17 December, priced £3.95 and £5.99 respectively, from all good newsagents and comic shops. Direct retailers can obtain copies of both magazines from Diamond, while news trade should contact Seymour Distribution.